Manny Pacheco is a Southern California television and radio personality, who has worked on the Daytime Emmy-nominated In Studio on KCOP, NBC's Santa Barbara, and on KRLA, KFI, and KBIG. He's now the award-winning author of two books in the Forgotten Hollywood-series (Forgotten Hollywood Forgotten History and Son of Forgotten Hollywood Forgotten History) that shares America's s story through the eyes of actors from Hollywood's Golden Age. He currently hosts a Forgotten Hollywood program on the Financial News and Talk radio network every Saturday at 3p. His book series have been added to prestigious locations as the libraries of the Academy of Motion Picture Arts and Sciences, the American Film Institute, the Screen Actors Guild Foundation, and the Writers Guild Foundation; and the Hollywood Heritage Museum, the Niles Essanay Silent Film Museum, and It's a Wonderful Life Museum. He has also won multiple accolades from USA Book News, Hollywood Film Festival, the National Indie Excellence Awards, and a gold medal from the World Book Awards. He was also recognized by the Los Angeles Press Club. Vision4Media is developing the Forgotten Hollywood book series into a theatrical documentary for television / cable. The Ken Burns-style production has been pitched at the Festival du Cannes and the American Film Market. In "Forgotten Hollywood Forgotten History", Manny Pacheco presents portraits of character actors who were important yet not widely known in the history of cinema in the United States. He ties the works of these actors with events in American and world history, often remarking on the correlation between the roles they chose, or were cast in, and the social and cultural developments of the times. Some of the actors' names are easily recognizable, such as Lionel Barrymore, Claude Rains and Basil Rathbone, while others, like Ward Bond and Thomas Mitchell, may be less familiar to many readers. The acting career of each actor covered is juxtaposed to historical events and the actual personages these actors portrayed. Pacheco includes relevant photographs both of the actors and historic events and persons. 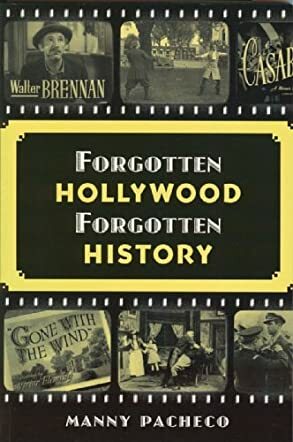 "Forgotten Hollywood Forgotten History" is a fascinating look at the roots of modern-day cinema. I enjoyed learning more about some of my favorite actors, such as Rathbone and Rains, and discovering actors who had just been names to me. The pictures Pacheco has gathered and included in the book are fabulous and make each chapter a tour not only of the covered actor but the history of the times as well. While I was familiar with Lionel Barrymore, his disability and the way he performed around it and led the way for other disabled performers was a revelation. Tonight, I'll be trying to find an online version of the first talking role Rathbone played, as Philo Vance, in a film I never knew existed, thanks to Pacheco's scholarship. Whether you are a classic movie buff or simply curious about this book, I think you'll be as pleased with it as I am.